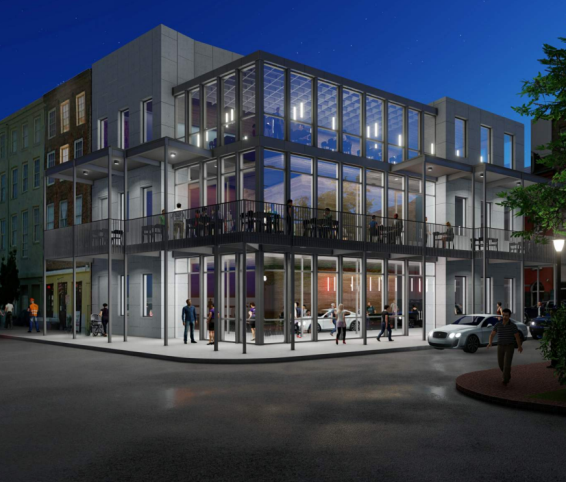 This Thursday, March 28, the New Orleans City Council will consider an appeal of a recent Vieux Carré Commission (VCC) decision of conceptual approval for a new three-story structure at 336 Decatur St. After careful consideration of the implications of this approval, VCPORA has decided to file this appeal on the grounds that this project fails to meet the standards the VCC requires in evaluating new construction and could set a damaging precedent for future infill projects in the French Quarter. 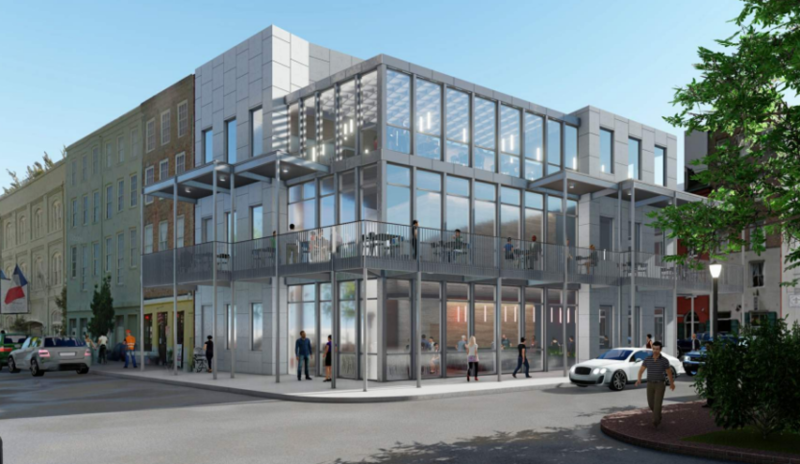 This project will be situated on an incredibly conspicuous lot at the intersections of Decatur, Conti and N. Peters Streets – it will be visible for blocks in each direction, from as far away as Woldenberg Park and potentially the French Market. The rendering above depicts a night-time scene of a traditional restaurant with a modest number of patrons and subdued interior lighting but any number of alternative scenarios are possible – business operators come and go. Now imagine this in full operation as is typical of businesses within the Entertainment Districts of the Vieux Carré – walls of televisions, neon, digital signage, strobes of flashing light. At this point, no tenant has been identified, though a similar project was introduced previously as a Margaritaville. No exterior lighting may glare into, or upon, the surrounding area or any residential premises. In addition, no exterior lighting may be used in any manner that could interfere with the safe movement of motor vehicles on public streets. The light level shall be no greater than one-half (0.5) footcandle at a residential property line and one (1) footcandle at any non-residential property line or public right-of-way line. If such an arrangement with the operator is crafted, this could be viewed as a problematic mechanism for interior regulation or the creation of unenforceable provisos – particularly if the violations are most notable in the very late or early hours. Is it reasonable to assume that a city inspector will measure footcandles emanating from this establishment at 2:00 a.m.? How would the city enforce these violations to bring this business into compliance? Bottom line: You don’t need a billboard when your interior serves as advertising. This is a three-story glass box, a beacon for blocks in multiple directions. And the city cannot effectively regulate anything spilling out of this transparent building. The staff reiterates its concern about how this will appear in reality with what is likely to be a very energetic and exuberant occupancy considering this location within the entertainment district. The renderings are very nice and clean but this is unlikely to represent this building accurately when in use, especially at night. As VCC jurisdiction does not extend to the interiors of buildings, we will have little control over any excessive signage or inappropriate lighting within the space. This largely glazed portion of the proposed building would have a “lantern” effect. We agree! Given the incredibly prominent location of the proposed site, any design for infill development must be held to the absolute highest standards, rather than questionably experimental design forms and material selections. We urge more consideration be given to those materials, overall levels of transparency and a design that is compatible and sympathetic to this most historic setting. With considerable design uncertainties, why move this design to the next phase? If you are equally as concerned that this structure will set a negative precedent for infill development in the historic French Quarter, please contact your Councilmembers.